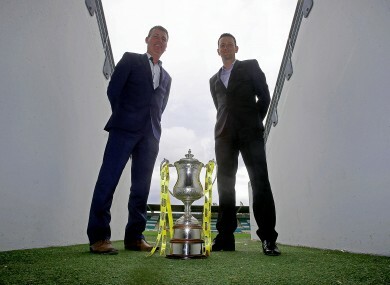 Managers Stephen Kenny and Ian Baraclough with the trophy earlier this week. AT APPROXIMATELY 5.50pm this evening (unless extra-time and penalties are needed) we will have a new first-time winner of the Setanta Sports Cup. Dundalk and Sligo Rovers contest today’s final at Tallaght Stadium (4pm) with both clubs aiming to add their name to the short list of previous champions — which reads Linfield, Drogheda United, Cork City, Bohemians, Shamrock Rovers and Crusaders. The competition was thrown into some doubt before the domestic season even got underway when Irish League sides Linfield and Cliftonville opted to pull out of the All-Ireland competition. And while the long-term future of the tournament remains up for debate, there is no question that the two finalists are desperate to clinch a piece of silverware at this early stage of the 2014 campaign. For the Lilywhites, currently third in the SSE Airtricity League Premier Division after last night’s results, it would mean a first major trophy for many of their young side. “For a lot of the players in the squad, it would be their first major silverware so there is huge incentive and it’s a great motivator,” Dundalk manager Stephen Kenny said this week. “We found ourselves 3-1 down to Coleraine which was disappointing but the players turned it around and went on to win 4-3. Then to go and beat Shamrock Rovers home and away (in the semis) was another great achievement. “It’s great for everybody at the club to be in a Setanta Cup final. To qualify for it first, you have to finish in the top two or win a major trophy. So from where we came from last year to qualify was a terrific achievement by the players. We know that Sligo have great pedigree themselves but we’re building the club here and are improving all the time. Dundalk have had to deal with the loss of influential captain Stephen O’Donnell, who will spend the remainder of the season on the sidelines after suffering a knee injury. And while the absence of his leadership has been felt, Kenny insists they will manage. “It was a huge blow as Stephen really is a terrific leader. He’s a unique player, left-footed midfielder with so much energy who plays in a role where we wouldn’t have a like-for-like replacement. Having bagged league title, FAI Cup and league cup in recent years, the current Sligo Rovers team will have experience of winning on their side. The Bit O’Red struggled for form during the opening month of the season but have turned that around and saw off Premier Division champions St Patrick’s Athletic by an aggregate score of 7-1 in the semi-finals. Despite that, they are still go into this evening’s tie as slight underdogs. And manager Ian Baraclough believes that cold actually work in their favour. “It’s perhaps an unusual position for this football club to be in but it might have a good effect as well,” Baraclough said. “Our fans have been treated to some good years and all of the sudden they could start thinking they have a divine right to win a trophy. “If we go into this game as slight underdogs then that’s fine. It almost gives you an extra step to prove people wrong. I’m all about doing that and winning against the odds and hopefully we can go and do it. There is no complacency there or divine right to carry on winning trophies. We know how hard it has been over the past few years to win those trophies and this will be even harder. “I’ve watched Stephen’s group of players and I know what they can do. We’ve always had close games with them and it will be a tough job to go and beat them. Email “First major trophy up for grabs as Sligo face Lilywhites in search of All-Ireland bragging rights”. Feedback on “First major trophy up for grabs as Sligo face Lilywhites in search of All-Ireland bragging rights”.